With the generous offer from Creighton Pond Day Camp, the Earth Day Festival will be held again in their beautiful location on Essex Street in Middleton on Sunday, April 29th from 12-3 in the afternoon. Mass Fish and Wildlife will again be teaching children to fish, adults and families will have an opportunity to paddle on the pond in a rowboat or canoe, and Essex County Beekeepers and other backyard farmers will be educating attendees. The afternoon will include storytelling for grades 3 and up, titled, “Stories from the Earth” by Judith Black, a professional storyteller. 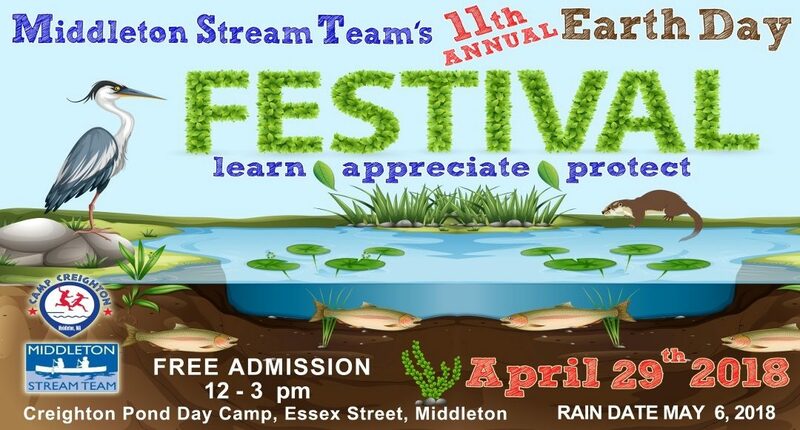 Science demos from Masco and Essex Tech environmental students, insect and pond exploration areas, crafts, owl pellet dissection, toddler duck water game and so much more! IRWA will be presenting a water conservation and river protection themed puppet show. The Flint Library as well as Boy and Girl Scouts will also be doing exciting activities. Sol Bean and other vendors of green and healthy products will be there also! Eco-friendly raffles will include a huge stone birdbath, hand-crafted bird houses, mulch, firewood, painted tire swing and tire dog bed, children’s eco-basket, framed winning wetland photographs, camp sessions, a new wheelbarrow from Rocky’s hardware and many other items! Food will also be available at nominal cost so come for lunch and stay the afternoon! The entire event and parking is FREE. 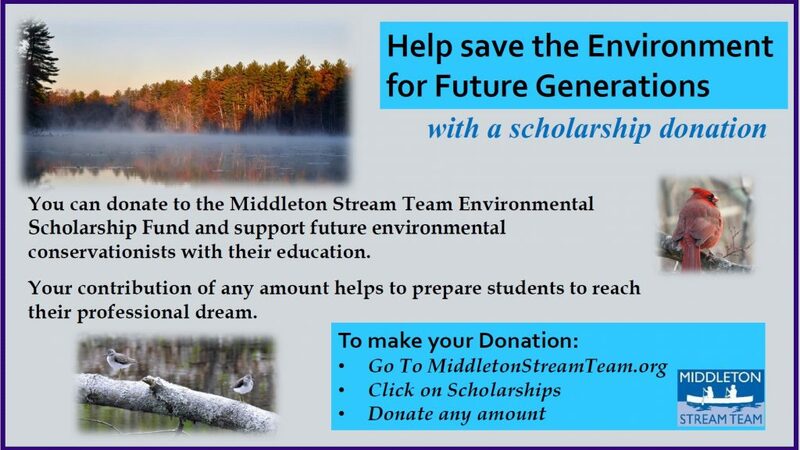 The Middleton Stream Team is a non-profit organization dedicated to environmental awareness and appreciation that ultimately leads to stewardship and protection of The Ipswich River, its tributaries and the surrounding wetlands and watershed of which Middleton is built upon. Heavy rains will postpone the event to May 6th. Any postponement will be announced on the team’s website, www.middletonstreamteam.org Learn and have fun outdoors in a beautiful and natural setting, join us on April 29th. There are activities for all ages! Save the date!